Immunological Technologies solves the Protein-Folding Problem! One part Tom Clancy, one part Gregory Benford, Leonard Crane's debut, Ninth Day of Creation, successfully weaves cutting-edge scientific speculation into a political thriller with a propulsive, Byzantine plot. ...an ambitious work [with] something for most everyone to like about it. 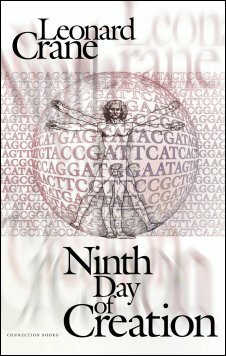 Crane's book is one of what will certainly be many science-in-fiction novels that focus on the consequences of sequencing the human genome. Crane spins a gripping tale with all the complexity of a Tom Clancy novel. If you are reading NDOC as supplementary material for a class, please let me know the details. I'll post a list sometime. Thanks! A special hello to Columbia Chem 1404 students. You'll have no trouble finishing this book for ChemWrite! If you liked the pervasive science of ''Jurassic Park'' and the undercurrent of global threat in ''The Hunt for Red October,'' you should also enjoy this book. An unanticipated development in germ warfare technology, brought about by the solution to the protein-folding problem, becomes a fast-burning fuse in this intricately-plotted tale of scientific and military adventure. Published by Connection Books and now available at Amazon.com. Or find a poor implementation by Google on the Google Books site. Browse or join the book discussion at Amazon.com. Or read an early professional reader's report. Or fold proteins for my Genome@home team! Journalists may request a review copy from the publisher. Copyright © 1998-2006, by Leonard Crane. All rights reserved.